Traditional fraud prevention measures focus on discrete data points such as specific accounts, individuals, devices or IP addresses. However, today’s sophisticated fraudsters escape detection by forming fraud rings comprised of stolen and synthetic identities. To uncover such fraud rings, it is essential to look beyond individual data points to the connections that link them. No fraud prevention measures are perfect, but by looking beyond individual data points to the connections that link them your efforts significantly improve. Neo4j uncovers difficult-to-detect patterns that far outstrip the power of a relational database. Enterprise organizations use Neo4j to augment their existing fraud detection capabilities to combat a variety of financial crimes including first-party bank fraud, credit card fraud, ecommerce fraud, insurance fraud and money laundering – and all in real time. Discover how KERBEROS, using a Neo4j graph database, developed a compliance management system to help companies react quickly to suspected money laundering. Discover how financial services enterprises are using graph technology to prevent and detect financial fraud. This webinar walks you through the creation and operation of an example fraud detection application powered by Neo4j. Catch fraud rings and prevent their incursions by augmenting discrete data scrutiny with data relationship analysis. 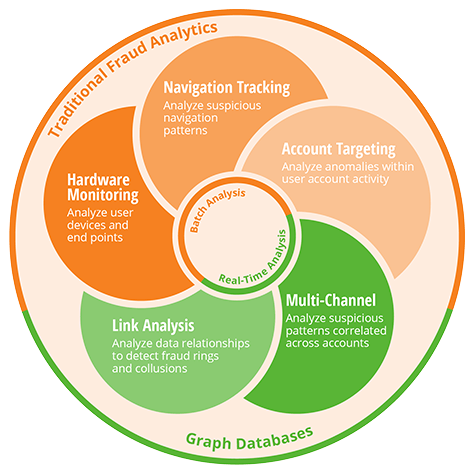 Whether automated or human-augmented, graph analysis makes your fraud analytics go further. By the time a relational database calculates the complex relationships within a fraud ring, the criminals have already struck and have likely disappeared. A graph database ensures that relationship-oriented queries are conducted in real time, so your anti-fraud team has a chance to strike first. In addition to outright and direct fraud detection, graph databases are also a powerful weapon against the murky world of money laundering and embezzlement, whether from internal employees or from sophisticated fraudsters posing as wealthy clients. Uncovering fraud rings requires you to overcome the computational complexity associated with the traversal of data relationships – a problem that’s exacerbated as a fraud ring grows. Whether you are building an automated fraud detection system that detects and prevents fraud as it occurs or you are providing an analytics tool to your analysts to help with manual fraud detection, real-time traversal of a complex and highly interconnected set is essential. Fraud rings are continuously growing in shape and size, and your fraud detection application needs to accommodate this highly dynamic and emerging environment. Unlike relational databases, Neo4j stores interconnected data that is neither purely linear nor purely hierarchical, making it easier to detect rings of fraudulent activity regardless of the depth or the shape of the data. Neo4j’s versatile property graph model makes it easier for organizations to evolve fraud detection data models, helping security teams match the pace of ever-advancing fraudsters. Neo4j’s native graph processing engine supports high-performance graph queries on large datasets to enable real-time fraud detection. The built-in, high-availability features of Neo4j ensure your mission critical fraud detection applications are always available. Discover how graph databases help organizations detect – and prevent – fraud ring behaviors in real time. 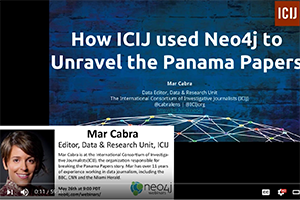 The International Consortium of Investigative Journalists (ICIJ) used Neo4j to unearth the millions of hidden connections in the landmark Panama Papers investigation – hailed as the world's biggest-ever financial leak story. Discover how your institution can tap into the power of graph databases for sophisticated fraud detection and link analysis to catch criminals in real time. Banks, merchants and credit card processors companies lose billions of dollars every year to credit card fraud. 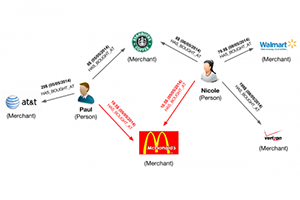 This Neo4j graph tutorial covers a common credit card fraud detection scenario. 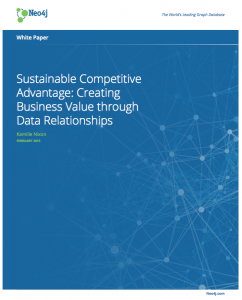 Your enterprise is driven by connections – now it's time for your database to do the same. 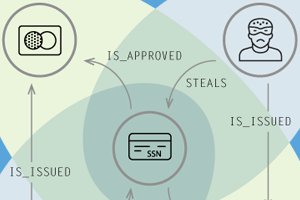 Click below to download and dive into Neo4j for yourself – or download the white paper to learn how graph databases discover connections in today's most cutting-edge fraud detection solutions.